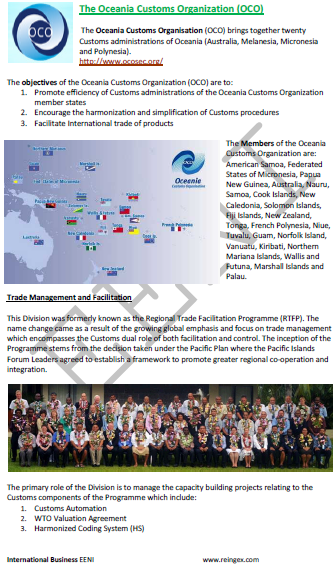 Syllabus of the Online Course (Subject): Oceania Customs Organisation (OCO). Description of the Online Course: Oceania Customs Organisation (OCO). The Oceania Customs Organisation (OCO) brings together twenty Customs Administrations of Oceania (Australia, Melanesia, Micronesia, and Polynesia). The Members of the Oceania Customs Organisation are American Samoa, Federated States of Micronesia, Papua New Guinea, Australia, Nauru, Samoa, Cook Islands, New Caledonia, Solomon Islands, Fiji Islands, New Zealand, Tonga, French Polynesia, Niue, Tuvalu, Guam, Norfolk Island, Vanuatu, Kiribati, Northern Mariana Islands, Wallis and Futuna, Marshall Islands, and Palau.